DENVER, CO--(Marketwired - September 30, 2015) - Once all the hard work has been done to plan and build out a strategic customer engagement initiative, the last "to do" is to put in place suitable and sufficient support resources to manage the new operations and technologies. One large multinational retailer was completing an Oracle Service Cloud implementation with Eventus when it realized it was going to need ongoing help supporting ongoing business changes. 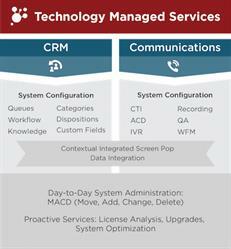 It is continuing to leverage Eventus contact center consulting expertise by using Eventus Managed Services to provide application support for its new CRM system. Following completion of the transition, the Eventus managed service team and internal client teams embarked on an aggressive reporting initiative that opened up visibility to the company's executive team by configuring more than 25 reports on 6 management dashboards. These reports were delivered on time and provided insight into numerous analytical points including FCR and agent productivity as well as queue behavior, call drivers and volume forecasting. As the Eventus team continued to gain a deeper understanding of the company's internal business processes, it transitioned into a more strategic consultative role, proactively engaging with multiple internal company teams on gaps within business processes, as well as projects to ensure system health and license optimization. This strategy was deemed highly valuable to all teams as it allows for more efficient communication and a better functioning system. In addition, as the company continued to implement new configurations in the system, Eventus was on point to ensure Oracle Service Cloud was operating correctly and agent productivity was not being compromised. The company's internal support team is now fully able to shift focus to training and ramp up for the upcoming holiday season while Eventus continues to optimize the system through identified initiatives and fulfilling requests from the the company to evolve the system along with the organization's ever-changing business. "Back in the era of on-premises applications, IT typically played a significant application support role for production applications," said Milos Djokovic, Eventus managing partner. "However, modern IT organizations are often not set up to provide full application support for cloud-based applications. We designed Eventus Managed Services to fill that gap for our clients." 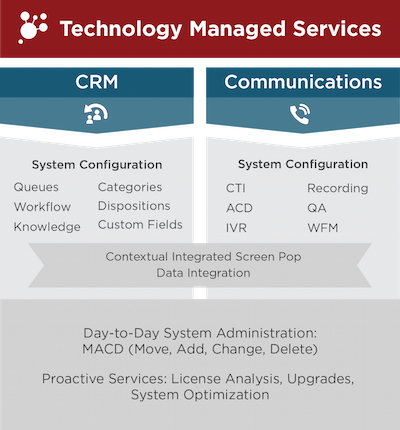 Eventus Technology Managed Services is a subscription-based application support offering for Cloud-based CRM and enterprise communications applications. Complementing vendor tech support and playing the role internal IT has traditionally played for on-premises enterprise applications, Eventus Technology Managed Services gives cloud application users the ongoing support they need to ensure their systems allow them to meet their business objectives. Available services cover day-to-day production support, break/fix support, proactive optimization and functionality enhancements. Eventus offers its Managed Services via a flexible a la carte pricing model that allows its clients to sign up for specific services they need to complement their internal capabilities. Eventus Solutions Group is a nationally recognized consulting and managed services firm that helps its clients optimize the way they engage with their customers online, over the phone, via mobile devices and through social media. The company's unique business model has earned it recognition on the Inc. 500 list of fastest growing private companies, and has helped Eventus build a client list that includes some of the most well-known brands in healthcare, insurance, retail, communications, government and other industries. For more information, visit http://www.eventusg.com, or follow us on LinkedIn or Twitter @eventusg.